I’ve always loved the art of storytelling. As a child, when I wasn’t at the barn, you could find me at the library or writing stories of my own in my “office” (a nook under the basement stairs). I was a horse crazy kid, studying equine catalogs full of equipment to learn as much as I could about the equine world. The fact that I’m able to write professionally, and get paid for it? It’s amazing. I once read 130 books in a summer as a child. Yes, I’m serious. I’m a certified equine massage therapist. When I was 15, I won a songwriting contest and received an autographed photo of BBMak as my prize. In 2008 I was one of 12 students accepted to the Salem State Summer Poetry Seminar. It changed my life. I’m a diehard advocate for the Oxford comma. I attended Westfield State University where I majored in English with a concentration in writing (and, being determined to also pursue my love of music, double majored in music performance on the flute). 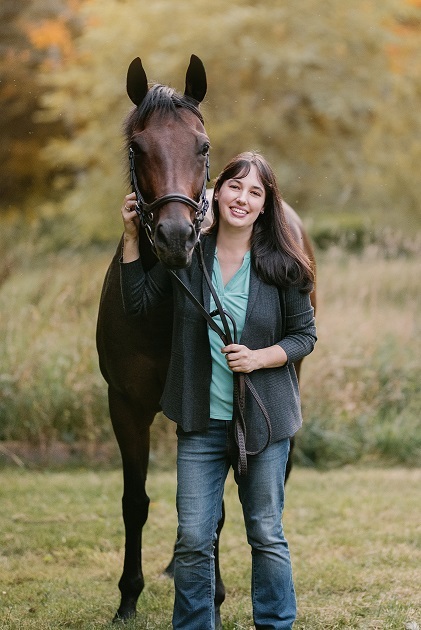 After graduating college I worked as a veterinary receptionist where I gained a wealth of knowledge on small animal health and care, and I have been able to put this knowledge to use in my writing on both equine and pet topics. With a background in creative writing and poetry, and experience in journalism, I’m a versatile writer who’s always up for a challenge. My work has previously appeared in Forbes, American Veterinarian, The Equine Journal, The Mighty, Above the Rail, Dirt Road Daughters, Horse Junkies United, and Massachusetts Horse Magazine, among others. I frequently write blogs for a variety of companies, and my marketing content can be found in numerous websites and materials. I’m always up for a challenge, and love helping businesses craft their stories and find the best ways to reach their audiences. Effective content is more than just words on a page. Find out how I can help your business through professionally written copy.